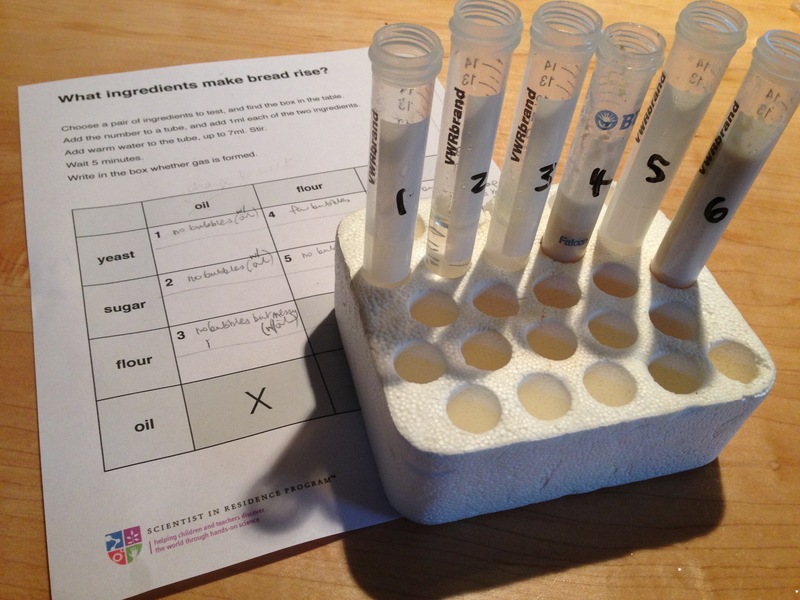 Test pairs of ingredients for making bread, to find out which ones make gas, which causes dough to rise. Dough will rise as a chemical reaction happens in it: a gas is made, and the bubbles push out on the dough, making it rise. [While we wait for our dough to rise] we’ll experiment with the ingredients to find the ones that make a gas and make the dough rise. You might have an idea already and can test your idea. We’ll mix pairs of ingredients. Choose a number in the table (attached below), then find the corresponding pair of ingredients. Add 1ml of each of the ingredients using the stir sticks (do not use the same stir stick in different ingredients). Then make other tubes for other pairs of ingredients. Once all the tubes are ready with their dry ingredients, hand out bottles of warm water. Fill to the 7ml mark and use a new stir stick to stir well. Wait at least 5 mins for results, then ask students to record the ml of gas in each tube in the table. Ask students to compare their data to conclude which combinations make the most, and some gas. 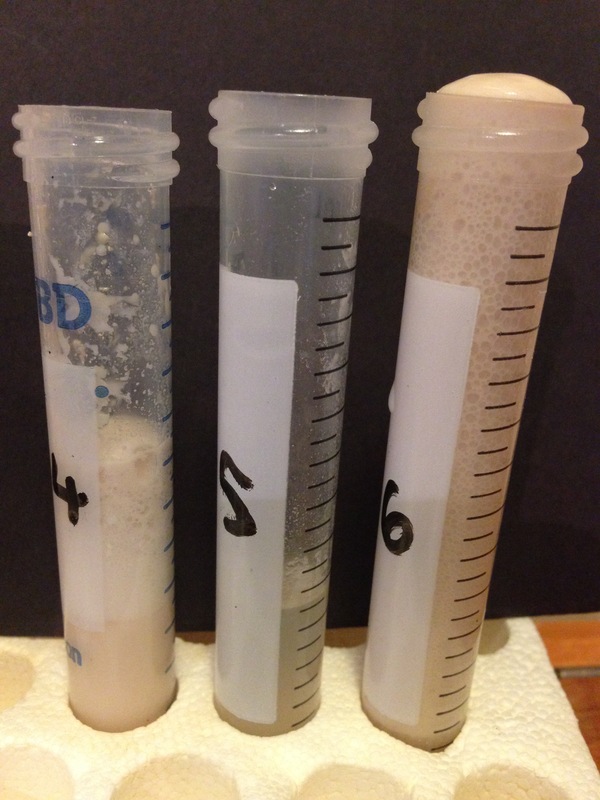 The yeast and sugar make enough gas for bubbles to likely spill over the top of the tube. Yeast and flour make some gas bubbles too. Yeast and flour/oil/salt make very few or no gas bubbles (probably because the yeast has some sugar stored in it already). Note: the numbers on the tubes in the photographs above do not correlate with the numbers in the attached table, as the table has since been simplified. Flour is made up of chains of sugar molecules. The yeast can break up these chains, then make gas from the sugar molecules. Yeast has some sugars stored in it, so can make a few carbon dioxide bubbles from these stores.